What allows Star Wars ships to slow down? In the universe of Star Wars, many ships (excluding the X-Wing - the large circles on the front are retro thrust nozzles) appear to lack forward-facing thrusters or retro thrusters. 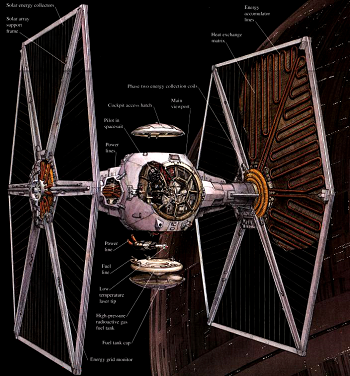 The TIE fighter has 2 engines, both which face backwards. So, what slows it down? I read on Wookiepedia that they turn using etheric rudders, and read on a chat forum (I do not remember which) that they can use etheric friction to slow down, but I couldn't find any references to this. Do they perhaps use special repulsors to slow down? In this question many people answered that they use special repulsors to control their flight and direction, so perhaps could the same technology be used to slow them down? So, how do Star Wars ships slow down? EDIT: To clarify, I want answers based on the Star Wars universe, not real-life physics. I am also willing to accept answers based on the Star Wars Extended Universe (now named Star Wars: Legends). Ships in the Star Wars universe travel through a property known as "ether" which acts as a dragging force. This explains a considerable number of issues including why ships have a top speed, how explosions can be heard in space, why there's no overt worries about relativistic effects, why ships need to burn fuel constantly to maintain their speed, how tight turns are made and why TIE-Fighters don't need retro-thrusters. PH: If you need to, you could say the interstellar medium in Star Wars does have an ether, which would explain such pulpy things as sound, concussion rings, visible drag, and such odd tech callouts as "an etheric rudder" from Heir to the Empire. Only if you ⋆really⋆ need to, though. Like if it helps you sleep at night and whatnot. Short answer: Nothing. Star Wars is scientifically inaccurate, you just have to accept that. I view Star Wars as a fantasy story rather than a science fiction story because it has nothing to do with science. If you want to stop in space you have to apply the same impulse towards the opposite direction to slow down. Which means if you have one main engine in the back of the ship: You have to turn your ship around. If you don't want to do that you have to have an engine just as powerful as your back engine in the front or have a weaker engine burn much longer than your main engine. The fact alone that the engines are constantly running is a flaw because in reality this would keep accelerating the ships indefinitely. There are many, many other flaws such as space stations and ships not having any orbital velocity, sound in space (! ), X-Wings having to put their wings together in order to be faster (reduce drag in space? :D ), laser/light sabres neither consisting of lasers/light nor being sabres, parsecs being a measure of time rather than a distance (just because a parallax second has "second" in it, doesn't mean it's a measure of time) etc. You NEVER see an X-Wing use reversed thrust in ANY of the movies. It is also stated that repulsorlifts are responsible for maneuvering but if they were they would have to have nearly as much thrust than the actual engines which makes absolutely no sense. Not the answer you're looking for? Browse other questions tagged star-wars star-wars-legends spaceship or ask your own question. Where do TIE Fighters generate thrust? Why was Darth Vader's cape fluttering at the end of Rogue One? How do the star fighters in Star Wars fly with no side thrusters? How do ships control their aerodynamics in Star Wars? How was the status quo between the fleets maintained? Are any ships in Star Wars capable of intergalactic travel? Why do capital ships in Star Wars engage at close range?